Last month at the Natural Products Expo West (March 9th) in Anaheim (California) Ziggy Marley launched his own food line: ZIGGY MARLEY ORGANICS! Currently it features two products: Coco'Mon, a coconut cooking oil, and Hemp Rules, a hemp-seed mixture. They are the worlds first flavoured roasted hempseeds and organic culinary coconut oil. Both products are non-GMO verified, gluten free and Kosher. Watch below a clip which explains the GMO topic. Ziggy Marley: "If I was given a choice and saw something that was genetically modified and saw something else from nature, I would choose the stuff that’s from nature. I don’t want to put anything into my body that’s not natural, that wasn’t created by nature, because we are a part of nature." 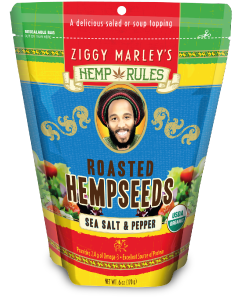 Actually this is not the first time for Ziggy Marley to be involved in hemp and food. Back in 2000 he endorsed Hemp Bar, an energy bar produced by a San Diego based company.